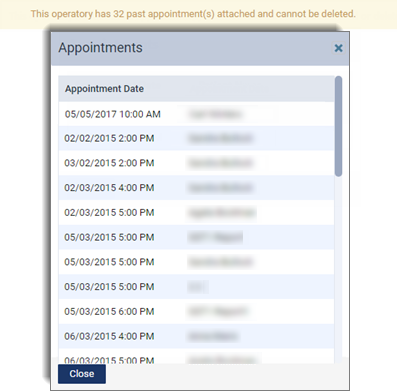 You can inactivate operatories, which correspond to columns on your schedule, if those operatories do not have any future appointments scheduled in them. An inactive operatory does not show on the schedule and is unavailable as a view option for the schedule. On the Settings menu, under Location, click (or tap) Operatories. On a location's Operatories page, select an operatory. The options for editing the operatory become available. 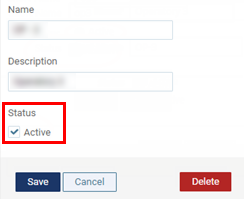 Tip: You cannot inactivate an operatory that has future appointments and/or events scheduled in it. If this operatory has appointments and/or events scheduled in it, a message in a yellow box appears. To view a list of those appointments and/or events, click (or tap) the yellow box. Under Status, clear the Active check box. This option is available only if there are no future appointments scheduled in this operatory.